Mortuary body coolers are an essential tool for not only preserving bodies but also to keep internal organs preserved for transplants. At Polar King International, Inc. we understand the critical importance and sensitivity regarding the storage of the deceased. The Polar King Mortuary Walk-in Cooler was designed specifically to meet the demanding needs of the funeral home, crematorium, and morgue industries. 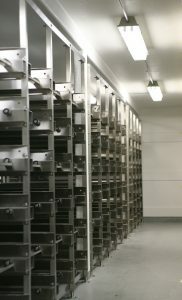 With the desired goal to lower funeral costs while also offering greater flexibility for both the bereaved and the funeral home, the mortuary walk-in cooler unit provides increased operational performance, lower energy costs, and a highly effective method to store bodies. 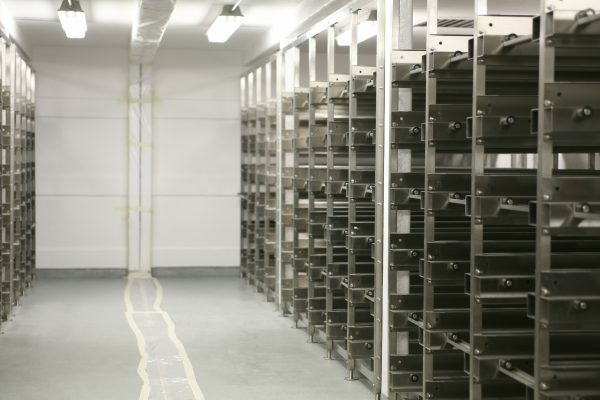 The interior of the unit can be designed to accommodate a mortuary roll-in cart, caskets as well as dressing tables. Additionally, Polar King offers PMS color matching at no additional charge, this will allow users to match the color of their existing building or facility. Polar King can provide adjustable vinyl coated shelving or stainless steel shelving for your mortuary walk-in unit. As an optional upgrade, Polar King can install a heavy duty stationary or removable rack system throughout the interior of your mortuary walk-in unit. We offer a number of configurations, sizes, and styles of shelving, and we can also customize any shelving requirements that may be needed. All Polar King walk-in coolers meet strict sanitation requirements and are NSF certified. With all of our units built at our facilities, Polar King also has the ability to fully customize your mortuary walk-in to meet your specific needs and capacity requirements. Constructed of with a seamless fiberglass design, this self-contained mortuary walk-in cooler provides a continuous surface which keeps the insulated structure completely intact; free of moisture damage and bacteria formation. Plus, an anti-microbial finish is used on the interior to further ensure a sanitary environment. Each of our walk-in units arrives pre-constructed, pre-assembled and ready to operate with a simple electrical connection. The annual operating costs of traditional metal panel units can be as much as 62% higher than that of a Polar King. With seamless fiberglass construction, our units prevent moisture penetration, retaining the R-Value of the insulation. This will not only extend the life of your walk-in unit but also provide a long-term return on your investment. For more information about our line of outdoor seamless fiberglass walk-in coolers and walk-in freezers, contact us today!